Anarchism is Not Enough is a manifesto against systematic thinking, a difficult book by a famously difficult writer. 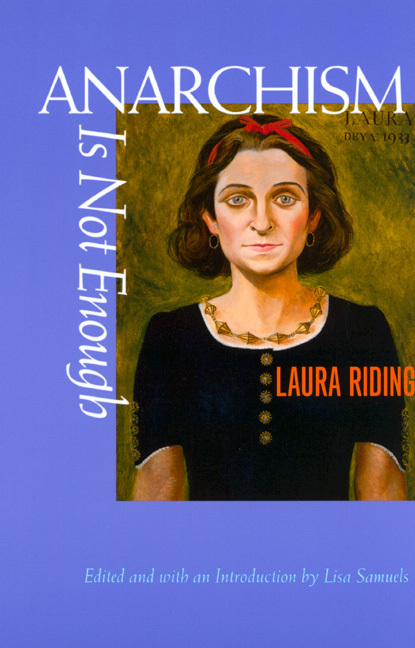 For the scope of its critical imagination, it is the most radical work of Laura Riding's early period. This period extends from the end of 1925, when she left America for Europe and Robert Graves, to 1939, the year she returned to America, renounced any further writing of poetry, and soon after married Schuyler Jackson. Published in 1928, when Riding was twenty-seven, Anarchism is a kind of early autobiographia literaria. Long out of print and now available for the first time in paperback, this is one of the most imaginative and daring works of literary theory ever written by a modernist figure. Lisa Samuels's edition sets the work in its historical context and elucidates its central intellectual difficulties. Her introduction and notes are a valuable aid to an understanding of Riding's work. Laura Riding was born Laura Reichenthal in 1901. She became a well-known and prolific poet, critic, and editor during her expatriate years (1926-1939) in Europe. She and Robert Graves ran the Seizin Press and collaborated on works including the influential A Survey of Modernist Poetry (1927). Riding's many books from these years include Contemporaries and Snobs; Poet: A Lying Word; The Life of the Dead; Progress of Stories, and her Collected Poems of 1938. After a long hiatus, she returned to publishing in 1972 with The Telling. She wrote steadily until her death in 1991. Lisa Samuels has published essays on poetry and literary theory as well as a book of poems, The Seven Voices (1998). She teaches contemporary poetry at the university of Wisconsin, Milwaukee.